I'm proud to have flown H-60 and H-65 helicopters as a military pilot, and a handful of airplanes as a private pilot. 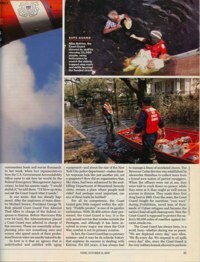 I led a crew from Air Station Atlantic City to respond in the immediate aftermath of Hurricane Katrina. 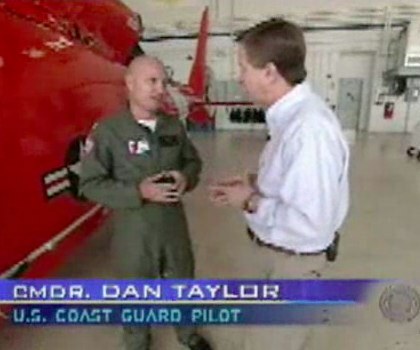 I was interviewed for a CBS Evening News Feature "Katrina's Heroes," on 19 Sep 2005. Me: "There wasn't a single time that we were in the air that we had to ask permission to do anything." Bob Orr: "And that's why the Coast Guard succeeded...."
The CBS page doesn't allow embeds, but the interview is still there at www.cbsnews.com/video/watch/?id=859909n. 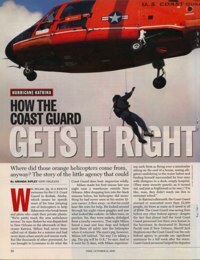 Time magazine had a fantastic story describing how the Coast Guard "got it right" in responding to Katrina. They used the picture above in that article. I was proud to have been there to serve the good people of New Orleans. One of the most special things I was able to do in a helicopter was to use it to bring a smile to a young man dying of cancer. I'm glad we were able to bring some joy into his life, which ended just over two months later. The good folks at TAM Communications recorded the event and tell the story best. My longest night of flying was as the Senior Duty Officer at Air Station Atlantic City when the 570 foot tanker "Bow Mariner" carrying 3.5 million gallons of industrial ethanol exploded, caught fire, and sank off the Virginia coast with 29 souls. The master of the Cruise Ship Song of America called the Coast Guard to evacuate his gravely ill daughter. I received a wonderful thank you card from him after she was treated and fully recovered. He wrote to me, "The contribution that you and your crew made it getting Cristina quickly to a hospital undoubtedly saved her life, and for this, I will always be indebted to you." After spending a wet, cold, hungry night after running aground, we found this young lady and her family during the first light search. We brought her back to the base, and as we were debriefing the family, I gave her some markers and invited her to draw on my wall, which was covered with foil as part of a Christmas decorating contest. It brought such a smile to see her drawing and read her note. "Thank you for saving us! And here is a thank you note from one of the crewman from the historic Schooner Alexandria that sank in a storm. Several of the crew were rescued immediately. My crew found him after he spent over six hours in the water. "I cannot adequately put into words my thanks to you and your men for saving my life and the lives of my shipmates on December 9, 1996. You now have a large cheering section from us and our families." One of the earliest thank you notes comes via the Commandant. Dr. Spizziri wrote to thank him for the professionalism of several Coast Guard units. I hoisted a crewman with a severe head laceration that took fifty stitches to sew up. This was one of my first hoists to a pitching sailboat. This is the day I learned that tying two trail lines together could work wonders for separating the helicopter from the things that want to pull it out of the air. Dr. Spizziri wrote: "I would like to draw special attention to the following: Lt. Dan Taylor who was the pilot of the helicopter. He showed great skill and patience in maneuvering his aircraft into position to get the guide line to us. As you know he had to get close enough for us to grasp the line while at the same time avoiding our 50 foot mast. It was so much fun to bring a crew and a helicopter to an airshow for a flight demonstration. I love to hear the excitement in this youngster's voice as I flew by. Pure joy. For him and me. In May 1995, I had the privilege of conducting a flight demonstration for the Andrews Air Force Base Joint Services Open House. It's a HUGE Air Show. It's great to hear the excitement in the kids' voices as we show them some what it's like to hoist someone into the mighty H-60.